With old homes and charming downtown drags, Louisiana small towns are a perfect escape from the hustle and bustle of New Orleans. Within just a few hours drive, you can explore the nature, food, and shopping that gives Louisiana its unique cultural diversity. Rural Louisiana reflects a rich past and these small towns are the perfect getaway! About 4 hours north of New Orleans, Natchitoches (Nack-a-tish) might be considered New Orleans’s older, calmer sister. 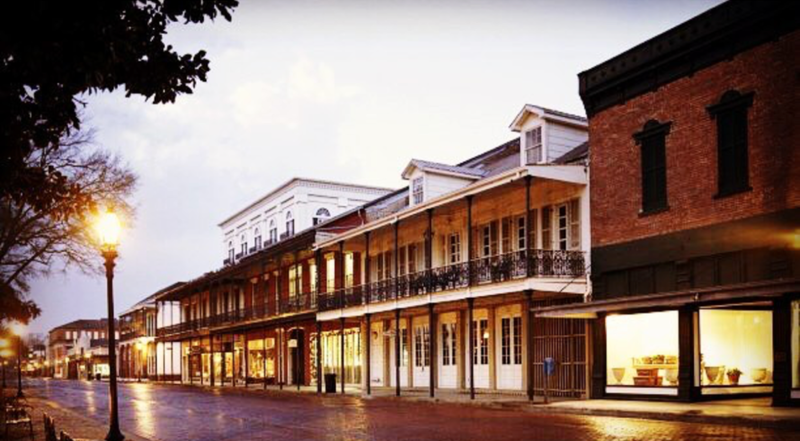 Settled by the French in 1714 (four years before New Orleans), the state’s oldest town spices up its white-columned, Southern plantation lifestyle with hearty pinches of Creole and Cajun influences. The buildings along this lakeside street are decorated with so many wrought iron railings that you’ll think you’re in the French Quarter. (Some locals say that’s where New Orleans got the idea.) Natchitoches is also home to the Steel Magnolias house from the 1989 hit. St. Francisville, a sleepy little town you'd miss if you were going too fast, is the perfect place to daytrip if you're looking to get away from the hustle and bustle of New Orleans. Just a little over a 100 miles away, St. Francisville is a vibrant hodgepodge of people, food, architecture, and Louisiana charm. St. Francisville is located deep in the heart of plantation country and is home to more than 150 historic structures scattered throughout downtown and the immediate area. You can see our complete guide to St. Francisville here. Nestled along the banks of the slow-rolling Bayou Teche, this pretty, little town, founded in 1859, prides itself on being the Crawfish Capital of the World. Its Crawfish Festival and Fair, held the first week in May, has drawn as many as 100,000 to the town of 4,500 for music, crawfish races, and crawfish-eating contests. Breaux Bridge is gorgeous historic town with world-class restaurants and a thriving Cajun music and folk art scene, and it's the perfect place to stop off for a meal and an afternoon of antiquing, and an even better place to take a weekend away. Founded in 1779, when a group of 300 immigrants from the Spanish province of Málaga came up Bayou Teche and settled here. New Iberia then became the terminal for steamboats traveling up the bayou from New Orleans, and it promptly developed the rambunctious character of a frontier town. New Iberia is home to grand plantation mansions, Cajun diners, and a downtown that you won’t be able to stop snapping. The Evangeline Theater is a particularly evocative Art Deco intrigue for tourists in this old southern town. And the bonus of New Iberia is that Avery Island, the birthplace of Tabasco (complete with a Tabasco Country store), is nearby.